Bon Chef, Inc. launches a Fine Porcelain and Bone China division. Foodservice supply manufacturer Bon Chef unveils a new dinnerware line at The National Restaurant Association Show. The company formally launched their dinnerware line with a ribbon cutting ceremony at the opening of the NRA Saturday morning in Chicago. The initial line consists of 8 collections; Circles, Wide Rim, Slanted Oval, Concentrics, Mid-Century, Stacks, Globe and multiple color Cocottes. 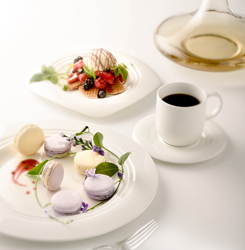 Each collection contains uniquely designed shapes created by Bon Chef’s design team available in alumina fully vitrified porcelain or bone china that comes with a 3 year chip warranty. “Chef’s have been asking us for years to create different shapes that will enhance their dining presentations. Our designers have done just that,” said Sal Torre. For more information, please call Bon Chef at 800-331-0177, or visit their website at bonchef.com.